Baby Night Light with Thermometer and Clock is a cute project to place near your baby's bed. It features a Nokia 3310 LCD, is controlled with a single push button and is powered by two AA batteries because it consumes very little current (approx. 800uA). Light Dimmer with IR control for incandescent light bulbs controlled by any Sony SIRC compatible remote controller. This circuit is an original idea of Ivica Novakovic and more information can be found on his website. Light Dimmer circuit for 230V I first built back in 1991. It's a quite powerful circuit capable of driving lamps up 1800W and still very simple to build. It's made to be used as a replacement for a wall switch or as the basic element for an analog light organ. Power Pic RGB with voltage control, is yet another circuit with a power RGB led. Its color and intensity are selected by two independent voltages. This project is another evolution of Pic RGB using a powerful LED combined with an infrared receiver, allowing a person to select the desired color on a remote control using SIRC encoding. The firmware was rewritten to allow the colors to be selected on an HSV color space. 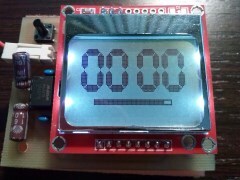 This project is an evolution of Pic RGB using a powerful LED. The original circuit was revised to use a Prolight 3W LED inside a full size globe lamp. The firmware is the same (version 3a) of project Pic RGB.! This project is based on an idea from the portuguese edition of Elektor magazine issue of Jul/Aug 2007. The original project uses a ATMEL Tiny microcontroller and assembly code. This version uses a PIC 12F629 and C code! This is a small circuit I built in December 2006 for Christmas holidays. It simulates the waving effect of the light of a candle when the air flows through it. PicPOV is a project based on 'persistence of vision'. 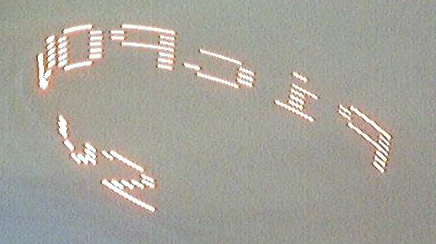 A PIC microcontroller blinks 8 LEDs on and off so that when waved through the air, a message appears to float in front of the viewer. 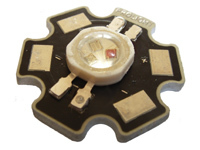 The Tiny Remote is a very compact infrared remote control with only two buttons to control an iRobot Roomba. 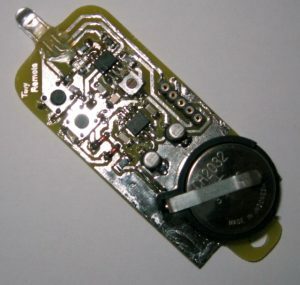 It is built mostly using SMD components to reduce its size, nearly to the size of a keychain and is powered by a CR2032 coin battery. Small Virtual Wall for Roomba, is a circuit that emits the same infrared pattern as a iRobot Lighthouse, preventing Roomba vaccum cleaner robots from crossing their infrared beams, acting as virtual walls. The software also sends other commands to the robot, on demand. Interrupt driven SIRC decoder, is my Sony SIRC infrared decoder. 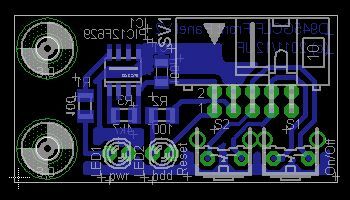 It is the infrared decoder of the Power Pic RGB infrared project and was developed to be integrated on any project that requires a decoder that doesn't block the program's main loop. This is my version of VirtualWire for PIC, optimized for low-end and mid-range PIC16 and PIC18 micro-controllers. It requires less memory than the full featured original version and was developed to be integrated on any project that requires unaddressed and unreliable messages. This is a bar-graph voltmeter for a 12V battery based on the well known LM3914 IC. It was developed mainly because it gives a nice look to the UPS, with its red, yellow and green leds. It is also easier to read than conventional digital or analog voltmeters. This is a simple circuit with two buttons and two LEDs to control the d945gclf Intel motherboard. This is my implementation of the SCHAER+ parallel port programmer. 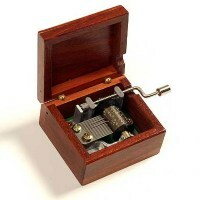 Have you ever tried to make a music box? Well this is my attempt at creating a circuit that plays the musical notes of a song every time someone pushes a switch. For simplicity, both song and player code are compiled together and uploaded to the PIC flash. 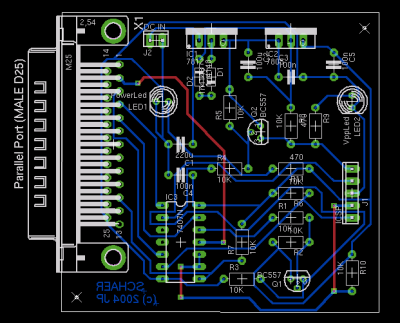 This project transforms a PIC microcontroller into an audio player. 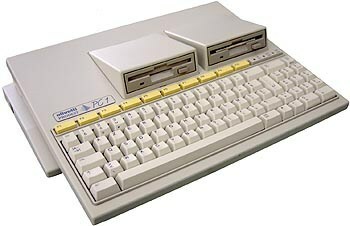 It plays short audio clips, previously stored in an external eeprom. The analog audio output is generated with a one bit DAC, i.e., using PWM modulation! Have you ever heard a PIC microcontroller speak? No? Then this project is for you. Using a PIC 18F1320 and some sound samples it is very easy to make it reproduce them using just one pin. Very very old project from 1994. The preamplifier is based on an old TDA1524 stereo tone/volume control circuit. It also includes a stereo VU-meter based on the LB1403N. Power amplifier that complements the audio preamplifier from 1994. It's based on the TDA2616/N1 from NXP(external link). It is able to drive two 8Ω speakers with a single supply voltage of 12V or more (Max 22V at full output power).